Kramnik-Deep Fritz match ends in 4-4 draw! Some media agencies are billing the Kramnik-Deep Fritz as a revenge match or "Man vs. Machine #2." While this is erroneous in every sense of the word (Kasparov DID defeat two previous "Deep" programs), what is true is that interest this match has drawn world wide attention. For two weeks the chess world and perhaps all of humanity will be watching the results with interest. Will Kramnik superior technical style overcome the brute force and tactical supremacy of Deep Fritz?? We shall see. The opening game in "Man vs. Machine" turned out to be anti-climatic as the battle ended in a 27-move draw. 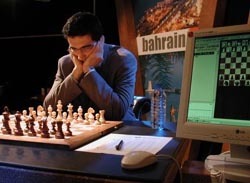 Kramnik trotted out the Berlin Defense against the Fritz's Ruy Lopez as he had done successfully in wresting the title away from GM Garry Kasparov in 2000. In the first game, Kramnik equalized with no apparent problem, and definitely has a style that will be hard to pierce. The Deep Fritz team will be hard pressed to open the game to reveal the brute force of its program. GM Vladimir Kramnik put on a display of technical precision to slowly grind down the silicon beast in game two of the Brains in Bahrain match. Fritz's ignominious 12...Bf8? was a valuable loss of time allowing Kramnik to do what he does best… capitalize on the smallest of advantages. After fighting through the complications toward the endgame, Kramnik showed impeccable technique and ended the a game by "advance simplification variation," 57.Rd5+. GM Nigel Short was critical of the Deep Fritz team for resigning the position on the right, but by all counts, the world champion would not have had a problem converting the full point in the ensuing pawn ending. Perhaps this game will show the glaring differences between humans and computers. GM Vladimir Kramnik showed why computers are still a step behind humans in terms of actual understanding of intricate positions requiring intuition and long-range planning. 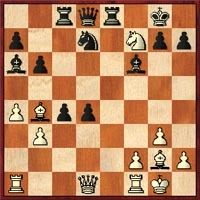 If one examines Kramnik's move 8…Be6! 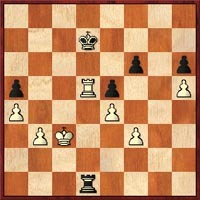 ?, it would be safe to say that most computer programs would never allow its pawns to be doubled on the f-file after 9.Qxf6 gxf6. However, with a deeper understanding of the position, Kramnik has able to create weaknesses and gain a strangle hold in the center. He later bore in with 25…Rd2, won a pawn and rendered white's army to its first three ranks for the entire middlegame. Impressive effort by Kramnik!! Again Kramnik managed to outplay Deep Fritz, but could not convert the full point after Deep Fritz put up a tenacious defense in a R+B ending. The game began as a Tarrasch and the World Champion emerged from the opening slightly better. The game took a tactical turn after 16.e5!? but simmered down into an ending where Kramnik had a passed a-pawn. There were many critics of Kramnik's 26.Rxc6?! and the Internet Chess Club (including GM Peter Svidler) was interested in the complications after 26.Bd4!?. Players at the ICC resigned the game to a draw, but Kramnik continued to maneuver until there wasn't an ounce of play left in the position. The Deep Fritz team is in desperate need of a win or this match could easily turn into a rout. There are several basic advantages computers have over humans. One is that they never fear; two, they never tire… as least not technically. GM Kramnik had his first lapse in game 5 which saw him blunder a piece on his last move 34… Qc4?? After 35. Ne7+, the World Champion resigned in lieu of 35...Kf8 36.Qxe5 which would defend the knight. The game was fairly equal throughout with white maintaining the slightest of advantages and players at the Internet Chess Club (ICC) were predicting another draw. It is only when Kramnik delved into a tactical skirmish that he made the oversight. Now the Deep Fritz team is back in the match. As the American sports idiom goes, "It's a brand new ballgame!!!" Kramnik uncorked what appeared to be a brilliant sacrifice with 19.Nd6xf7!!? but Deep Fritz snatched the piece, ran for cover and weathered the storm of Kramnik's Queen and slicing Bishops. In the final position, 35.Rxa6 is met by 35… b2! However debate is still raging on whether this was actually winning. Kramnik earned many critics who thought 19.Bd5 secured a lasting advantage. Kramnik stated regrettably in the post-game conference, "It could have been the best game of my life." NOW the unthinkable has happened… the super-solid Kramnik has tried to outwit the computer tactically and has failed in consecutive attempts. Kramnik must return back the basics of grinding the computer down to silicon dust. Game: Kramnik 0 - Deep Fritz 1 Also see annotated version at ChessBase. It looked as if Kramnik would return to his winning ways after building up a positional advantage against the silicon beast. No pawns were traded in the game which meant that this was the type of strategic battle that the World Champion could thrive in. "This sort of position is our worst fear," said Fritz programmer Frans Morsch. After 20… Kh8, players at the ICC were thinking of moves like 21… Rg8, 22… h5 and 23… g5, but Kramnik deemed it too risky and tried for a much slower plan… perhaps too slow. After 24.f4, Deep Fritz threatened to wrest the initiative as the game hung in a delicate balance. Kramnik refused to risk a 3rd consecutive loss and offered a draw… which was accepted by the operator. The finalé is set for Saturday , October 19th. The second half of the Brains in Bahrain match was clearly a disappointment for GM Vladimir Kramnik as he built a commanding two-point lead only to fritter it away. However, the consolation (even in defeat) is the incredible game #6 which Kramnik stated was "one the the best games of his life." Certainly this game was exciting, but would be the last "highlight" as the World Champion failed to break Deep Fritz in the last two rounds. Although the match was drawn, it does appear that Kramnik (overall) was clearly superior in his chess understanding. There was immediately talk of a rematch.